The evening’s program began with a demonstration of traditional granite splitting by Michael Gaudette. Michael had pre-drilled holes in a 400-pound slab of granite, and as the audience observed, he used “pins and feathers” to split the granite into four pieces: two posts, a step, and a cobblestone. 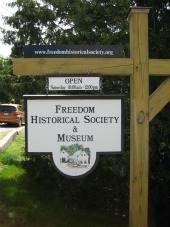 The posts and step will be used by the Historical Society. After a period of questions and answers, the meeting moved indoors for Carol Foord’s presentation, “Stonewalls, Cellar Holes and other Stoneworks: “Our Heritage and Treasures”. Carol spoke about the different types of granite and its composition. Examples of local granite were passed around for closer examination. Carol noted that Grant’s Tomb is constructed with granite from the Redstone quarry, which is located near WalMart in North Conway. She then showed photos of wonderful examples of how granite has been used in our area…stonewalls, bridges, chimneys and even homes.